Since yoga is becoming more and more mainstream, yoga therapy is rising in popularity too. I have studied medicine myself and have been practicing, studying and working with yoga for many years now. It is beautiful to observe that yoga therapy is not only being embraced by so-called ‘alternative people’ and ‘yoga lovers’, but by medical professionals alike! For example, in the yoga therapy programs that my school offers we have students working as physiotherapists, as well as students who have never opened a medical textbook in their lives. But what is yoga therapy actually? Yoga therapy is the art of guiding an individual with a physical (body) or psychological (mind) complaint, through the application of the teachings and practices of yoga. I am making a distinction between body and mind here as that is often how we perceive it. In reality, the body and mind are inseparable: thoughts produced by the mind influence physiological parameters in the body and vice-versa. Traditional, allopathic medicine continues to make this divide: you are being referred to a psychologist or psychiatrist for a psychological (mind) problem, and any other medical professional (e.g. pulmonologist, cardiologist) with complaints concerning the body. Yoga therapy, on the other hand, acknowledges the inseparability of the body and mind. The fact that the body and mind are so intertwined make yoga a beautiful tool. We can choose to work from a body or a mind perspective and usually, it is a combination of the two. Say a client comes in with lower back pain and is looking for relief. As a yoga therapist, you can examine her posture and give adequate asanas. You might as well, through an explorative conversation or guided meditation find what disbalance the client is experiencing in her life, and which beliefs are feeding this disbalance – which might have led to the physical complaint. How or where to start highly depends on the client, the therapist and the moment. There is no set structure to a yoga therapy session, there is no right or wrong way to go about it. The role of a yoga therapist is to facilitate a process in which the client is guided to understand what he or she is perceiving as a conflict in their lives. A conflict could be recurring thoughts like ‘I am not good enough’, ‘I need a husband and children to be happy’, ‘If only my boss could be more reasonable, then my work would be perfect’, etc. These perceived conflicts lead to stress on both body and mind level, potentially leading to an array of modern lifestyle diseases; the role of stress in the development of diseases is generally accepted. Our autonomous nervous system can be either in parasympathetic (rest and digest) mode or sympathetic (fight or flight) mode. The switch from one to the other is being triggered by our interpretation of whatever is happening within our body and around us. In simple words: we can perceive an event as dangerous/annoying/stressful… or not! The first option will set off the sympathetic nervous system, the latter will trigger the parasympathetic nervous system. Thus, if we often perceive our surroundings, our work, colleagues, our lives as stressful, or a struggle; changes are that your nervous system is mostly in the sympathetic nervous system. Yoga (therapy) works by its effect on the autonomous nervous system via (I’m sure you have guessed it by now!) the body or the mind. We can either do asana, or Pranayama or work on understanding which beliefs cause stress in our lives. Also a thorough understanding of how our mind works does the miracle. Yoga teaches that our mind is addicted to labelling and comparing. It creates a picture of a perfect self, a perfect surrounding, perfect partner and it thus disturbed by anything that does not match that picture. On top of that – the perfect picture constantly changes! Thus our mind is really addicted to happiness which is supposed to come from others or outer objects. Realizing that this addiction cannot be satisfied by feeding it but understanding the addictive mechanism. A yoga therapy treatment can be offered on its own, but could surely be added with the treatment with an allopathic doctor. Yoga therapy is not exclusive, it is not ruling out any other ‘method’ of healing by default. Rather, yoga therapy takes a holistic perspective of the person seeking treatment. It takes into account the person and the context in which this person is living – both practically as well in terms of his/her mind. 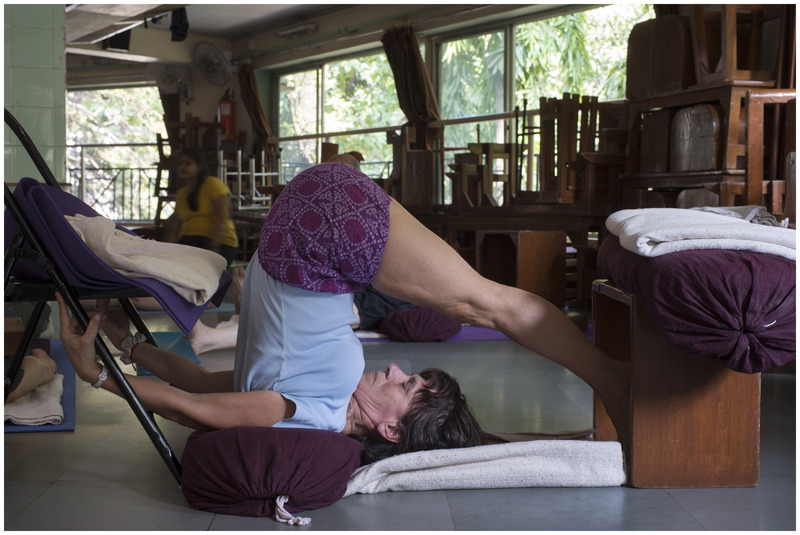 Merel is a yoga therapist, author and founder of the yoga and meditation school Parimukti. With her background in medicine, she is passionate about bridging the western and eastern sciences. Merel’s journey from medical student, to a health care policy professional, to a yoga therapist has taken her all over the world working with various kinds of patients, yoga students, meditators and musicians. Along the way, she has developed an in-depth knowledge of how human physiology, movement, relaxation, and interpersonal counselling can be combined to create a life to transform yoga therapy. You can contact her through her website, Facebook or Instagram.